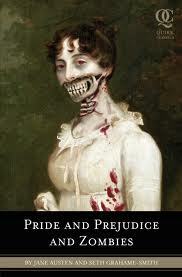 Exciting news the fantastic book Pride and Prejudice and Zombies will again try to make it to the big screen. Pride and Prejudice and Zombies written by Seth Grahame-Smith in 2009 takes on the world of Pride and Prejudice if they were in the midst of a zombie apocalypse. Great concept for a movie right? Lilly Collins is rumored to be the lead and Burr Steers to direct. However one should not become too excited because this movie has had constant problems with making it to the big screen. In December 2009 Natalie Portman to star with David O. Russell to write and direct the screenplay. Then Mike White was brought on to direct, then Craig Gillespie. Portman exited as the lead in 2010 but stayed on as producer. Many actresses have been named from Scarlet Johansson to Emma Stone to Anne Hathaway to Blake Lively. For now Collins is named and we shall see if the book will make it to the big screen. I am hoping but after learning of all the drama for the past four years I will not be holding my breath.